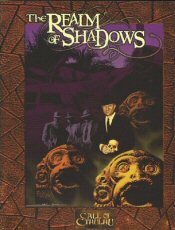 After the nice one-shot “_The Murderer of Thomas Fell_”, my new gaming group decided to continue with the 1930s horror genre and we played through roughly a third of the Realm of Shadows campaign for Call of Cthulhu. It ended with a near-total-party-kill. You can read the actual-play for “_Kith and Kin” (the first chapter) and “Provender of the God_” (the second chapter) over in the RPG section. One thing that I realize now that I’m writing those things up is how often I feel the need to explain why, as a GM, I’m doing this or that – making the bad guys attack here, adding some clues there, etc. Most of the “actual plays” out there only focus on what happened around the players' side of the table. But I’m finding it more interesting to also include what’s happening behind the GM’s screen. This is especially interesting because investigative adventures rely a lot on the GM improvising events and moving around clues to keep the story going, as opposed to, say, a dungeon crawl, where most of the design decisions can be done upfront during the preparation phase, and the improvisation is mostly about adjusting enemies to keep combat balanced. Adding the GM side of the game makes it easier for me to see what I did right and what I did wrong, and may even get me some constructive feedback on some of those decisions. I’ll try to keep adding things like that in the future reports.